Trim, UCase, Left, Right and Mid String functions: The VBUC is able to detect the data type being used and interpret the function (for example, Trim()), as a correct string function (in the example, Trim$()). It still recommended that you fix it before performing the migration. There are other tasks that may be necessary depending on the project and client, like developing test cases, training the developers on the .NET Framework, preparing the environment, and countless other specific requirements. But if you are considering a .NET migration, you should at the very least take into consideration performing the tasks mentioned above. Solves over 800 issues reported by our consulting staff, testing team, partners and end-users. 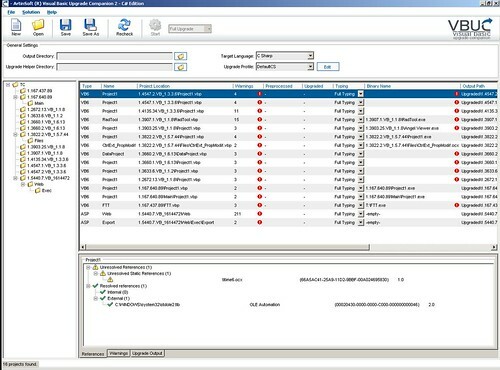 Adds the concept of Migration Profiles - you can select from a series of migration features and apply only those that you want to a particular migration. This greatly improves both the quality of the migrated code, and decreases the amount of manual work required after the migration. It also allows greater future expandability of the product. If you have been thinking about upgrading your VB6 applications to the .NET framework, think no more. 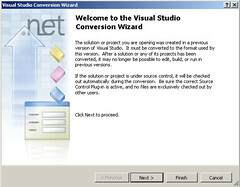 With this new version of the VBUC you will be able to have your .NET application up and running in no time! I may be a little late to the obituary, but VB6 support is finally, officially, irrefutably gone. The IDE, as stated in Microsoft's Product Life-Cycle guidelines, "... will no longer be supported starting March 2008". Even though VB6 (or Basic for that matter) didn't enjoy the best reputation as a programming language (best illustrated by the famous Edsger W. Dijkstra quote), you can't deny the huge influence it's had over the past 15 years. The easy-to-use paradigm followed by VB IDEs lent itself to be used by both amateur programmers, that caused many headaches during the years, and professional developers that were really able to harness the power and ease of use to create impressively robust solutions that are still running to this day. So if you are thinking of moving away form VB6, obviously I'm going to steer you in the direction of the Visual Basic Upgrade Companion. There is, however, another reason for this as well... pretty soon we are going to release a completely updated version 2.0 of the tool, which has some very interesting new features and does an incredible job of converting your VB6 code into the .NET language. Watch this space, as I will be writing about this new version soon!! For more information on the webcasts, check out this post over at Beth's Blog. 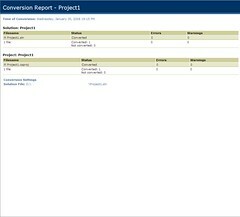 Now that Visual Studio 2008 is available, you might wonder what will happen with the Visual Studio 2005 projects generated with the current version of the VB Upgrade Companion (VBUC). For starters, it is worth mentioning that Visual Studio 2008 fully supports projects created in the .NET Framework 2.0, like the ones generated with the VBUC. The newer version of the .NET Framework (3.0, shipped with Vista, and 3.5, shipped with VS2008) keep the same core version of the CLR (2.0) as before, with very few minor changes. There are no compatibility or breaking changes like when upgrading from versions 1.1 to 2.0 of the .NET Framework. 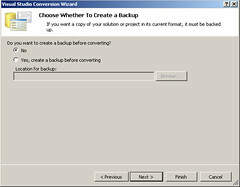 Once you click Next, you can select whether to create a backup of the project or not. I chose to NOT create a backup, since this is a copy of the project, since I will be comparing both .csproj files later on. Press Next. So there you have it. 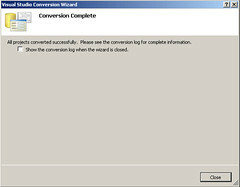 After converting this test VS2005 Windows Form application, I was able to continue working on it without any issues. It is true that the code generated by the VBUC will not take advantage of all the neat features of the .NET Framework 3.5, such as WPF, but you should be able to continue working with the migrated code after moving to Visual Studio 2008 without any problems. .... and so we reached 2008. This may seem like any other "average" year - the price of gas keeps going up, everybody talks about global warming, and will be an election year in the US (so we have one more reason to stop watching TV). However, for a large group of IT departments around the world, 2008 is a BIG year. 2008 is the year when Microsoft officially kills support for Visual Basic 6.0. The Mainstream phase will be in effect for six years after the product's general availability date. Visual Basic 6.0 was generally available in January 1999. Mainstream support will end March 31, 2005. The Extended phase will be in effect from seven to nine years after the product's general availability date. 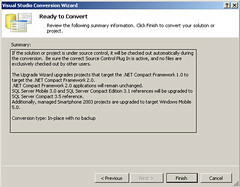 Extended Phase support begins in April 2005 and ends March 2008. Visual Basic 6.0 will no longer be supported starting March 2008. You can use the Visual Basic Upgrade Companion to move your application quickly and effectively from VB6 to either Visual Basic .NET or C#. Our experience in migration projects shows that by using the VBUC, you can drastically reduce the time it takes to move your application to the .NET Framework, reducing the risk vs. a complete rewrite, and keeping all your business rules, but in a modern platform that will allow you to use the latest technologies moving forward. You can find more information on the Visual Basic Upgrade Companion here.